He does after all, have quite a thing for Lizzy Bennet. Oh well. Me three. But I know why it's because I love constanly, even after all hope is gone. Pfft. 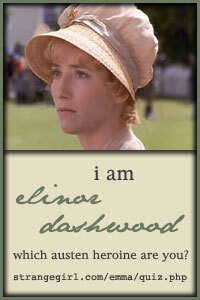 True enough, but that doesn't make me Elinor Dashwood, it makes me unable to move on!! I did the quiz and turned out to be the other Dashwood. LOL. Doesn't surprise me. As long as you mean Austen, not Austin, it's a date! oh and btw i am Elizabeth Bennet of course. Actually i find the large dresses rather liberating.. I got Anne Elliot, which makes me happy. But I am really nowhere near as sensible. This was fun. Thanks for posting the link!